I can FINALLY have my processor and staff do what I want –when I want. KNOW that the person you are pre-qualifying will use YOU and not even shop around. NEVER have to chase a Realtor or Referral Partner again because I have a “secret power’ that instantly makes them loyal to Me! Be the ONE card they give out instead of 1 of 3…. I understand that I have a full 12 months to review and implement these career changing proven systems and if I am unhappy for any reason you will refund every penny I invested. No Hoops- No Questions- No Hassles. 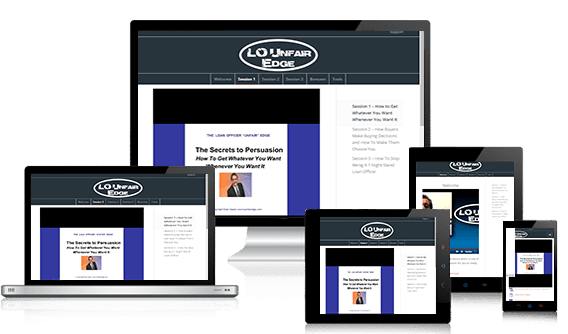 Announcing The Underground Sales And Persuasion Workshop That Gives You A True “Unfair Advantage” Over Your Competition. THE 22 LITTLE KNOWN BUT HIGHLY EFFECTIVE PERSUASION TECHNIQUES THAT ALLOW YOU TO GET WHATEVER YOUR WANT WHENEVER YOU WANT IT AND STILL HAVE EVERYONE FEEL GOOD ABOUT IT. In this session you will learn the 22 Secret Persuasion tactics that MUST be in place if you want to influence and persuade your Realtors, Prospects and Your Staff. This session will be jam packed with ideas you can immediately use right after the session is over. I’m not going to tell you too much about what is being shared here because I don’t want to reveal too much to those originators who aren’t serious. But here are just a few tidbits. Remember- I’m Not Just Sharing Ideas – I Am Going To Show You How To Use Each of Them To Grow Your Production. Plus I will Give You The Tools To Copy and Use! Ever wonder how to handle that difficult Realtor? Frustrated at your support staff and don’t know how to “control” them? For a long time I did a lot of pre-qualifications but wasn’t closing a lot of loans. That’s what started me on the journey of 10 years of intense study of persuasion and influence. The truth is in this business is that you can either make people do what you want them to do or you will fail. That goes for prospects, referral sources and may be most importantly for your support staff. THE REAL SUBLIMINAL REASONS BUYERS CHOOSE YOU INSTEAD OF YOUR COMPETITION. Discover the 3 methods prospects and Realtors use to make decisions so you can sell to them the way they are already programmed to buy. They must feel these 3 emotions BEFORE they do business with you . Visual and Vocal Clues people give you that tell you exactly how to sell them. A document you MUST give out when you first Pre-Qualify a client that will immediately double your conversions from pre-qual to closed loans. This one document alone will be worth 10’s of thousands in commissions to you in the first year alone. STOP- just re-read that title for a second! Do I really have to say anything else? A 50 cent “gift” that FORCES your clients to referr to all of their friends and family. Forget about asking them – this one “under -ground” tool does all the work for you! A group of obvious sources of business that 99% of loan officers haven’t even thought of going after or speaking to. 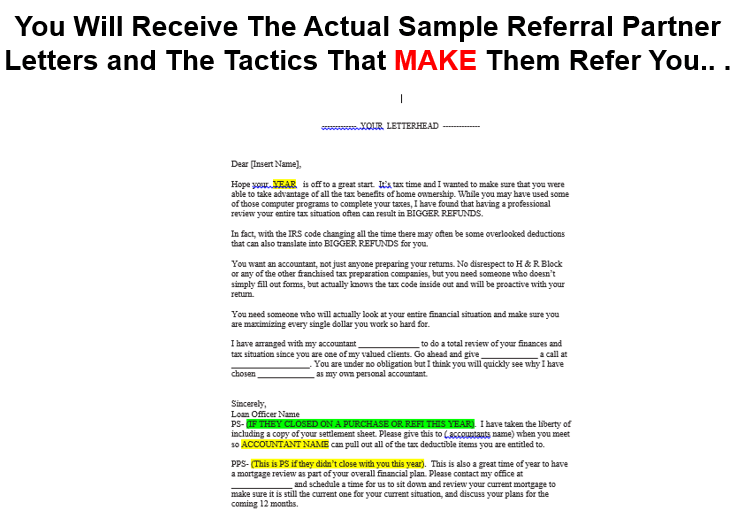 Discover how to “really” give a referral so you can start getting referrals back. One Tool That Costs 1.00 but acts like a sales army promoting you to your sphere of influence each and every month. A person who is referred to you by a previous client is 79% more likely to use you over another mortgage company. But we are often so busy chasing new business that we forget about the easiest customers to sell to – The ones that already know – like and trust us. I could go on and on but this one module has over 153 slides. It is jam packed with ideas you will use to IMMEDIATELY grow your production. Plus, I will give you them templates so you can simply copy and paste them for your own use. THE LOAN OFFICER UNDERGROUND PERSUASION AND SALES TRAINING WORKSHOP IS THE GAME CHANGER YOU HAVE BEEN WAITING FOR! … But only after they have been field tested and perfected. The truth is that these hours will go by quickly since you will finally have the answers you have been searching for on how to finally make your dreams come true and once and for all get rid of all of the things that have been frustrating you. WHAT SHOULD YOU INVEST FOR THIS POWERFUL UNDERGROUND GAME CHANGING INFORMATION? Since each session alone has the power to explode your production and your income it would be fair to make you invest 497.00 in each one. Heck just one extra 100,000 loan would more than pay back your investment. But you won’t need to invest anywhere near 1497.00 but we are going to limit the attendees to 50. Since I originate every day just like you I have to make sure I will be available to answer your questions. If your initial reaction is WOOO that’s expensive great. Please stop reading this letter right now because this is NOT FOR YOU! How do I know? This may sound harsh – and I am NOT apologizing. You have limited thinking and although I know the information I will share will change your entire business, you need some mindset training first What I am sharing is what actually works now and will work forever since it’s based on understanding how we all think and make decisions. If you would rather spend your time learning some on-line strategy that works today but won’t tomorrow well it might be best for you to go find some training elsewhere. BUT HOW HAS THAT BEEN WORKING OUT FOR YOU? Are you still wondering where your next deal will come from? Do you wake up hating not knowing that answer? What about your staff? Are they helping you or do you wonder how to get them to do what you need them to do to get your deals closed? SUCCESSFUL LOAN OFFICERS OPERATE ON THE HINGE THEORY. That means if they can invest 497 and get just a 10% increase income, that could be a $10,000 or even 30,000 -40,000 or 50,000 dollar raise in income. 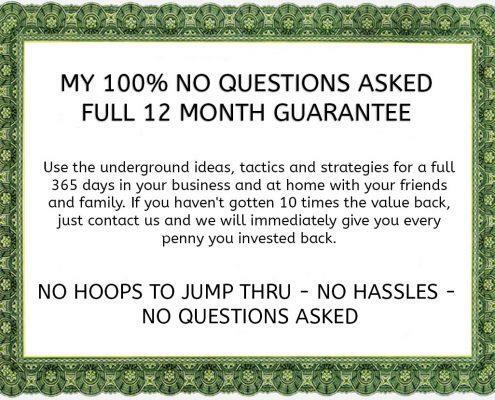 If you are an originator earning 200,000 a year and learn just one of these underground tactics that gives you a 10% raise well that’s 20,000 PER YEAR as long as you are an originator right? How many times would you invest 497 to get back 20,000 per year. What if you were finally able to convince your processor or closer to actually do what you need them to. What if you were able to get that Realtor to finally send you deals? What if you increased your conversion from prospect/ phone call to closed loan by just 10% using the secret underground tactics I am going to share? What if you were finally able to know the “Hot Buttons” with your spouse and kids that allowed you to truly control them in a positive way. Imagine your kids finally listening to you without arguments or shouting and punishments. Yes – this information is THAT POWERFUL!!! 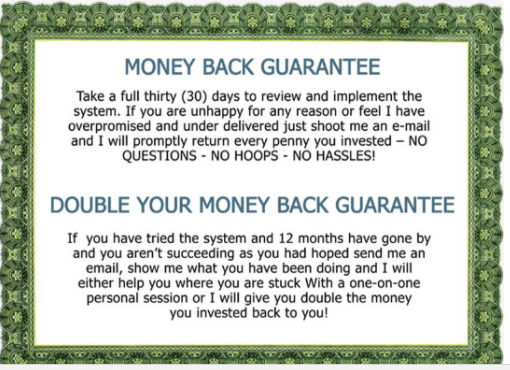 In fact – I have some seriously income boosting bonuses. One of them will give you 35 words that will totally change your business. You’ll want to paste it to your computer and use it whenever you speak to a client – realtor or staff. Sorry Can’t tell you any more than that – I want to save the “meat” for the serious originators who truly want to grow their business and learn these underground tactics. I want to make sure that I am available to answer your questions after each session. Plus, you need to quickly decide if you are totally committed to success or not. Candidly if you have to “think” about it then this is NOT FOR YOU. This System Contains The One 27 Word Sentence That Will Instantly Allow You TO Legally and Ethically Persuade and Influence Anyone at Any time…. 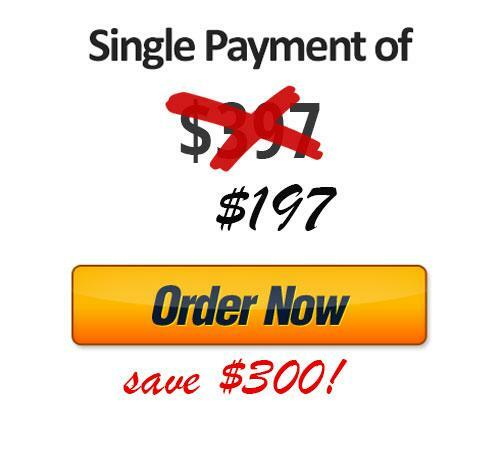 By acting today, only on this page, you will get The LO UNFAIR EDGE plus the bonuses I covered earlier worth 691 PLUS the “super bonus” Referral Partner Endorsement System worth 297 for a measly 497 ! WILL I BE ABLE TO BUY THIS LATER? I am not sure if I will offer this or not- but I DO KNOW that if I do based on my schedule it definitely will not be live and I will NOT be around to ask questions. WHAT IF I SIGN UP AND AM NOT SATISFIED? HOW DOES THIS APPLY TO MY MORTGAGE BUSINESS? Actually there is NOTHING more important to the success of this business than knowing the secret underground tactics I will be sharing. You must know how to get what you want and “persuade” others to use your services. But once you learn techniques you will start seeing your personal life change for the better too. Plus I am NOT JUST teaching you strategies and principles but I am also going to show you HOW to apply this to explode your production. You will have the exact same samples I use everyday and have used to close well over 1 BILLION In loans in my career. Before I became a member I really did not have a system, a structure or a plan to grow my business. Since I have become a member and a Mastermind Coaching member, I have used Brian’s system to generate additional business and income. The guidance and advice I have benefited from as a One on One Mastermind Coaching member has really helped me to effectively structure my business and shown me how to successfully grow my company. I plan to continue in Brian’s Coaching program for a long time to come. I find that in an ever changing and challenging market, you bring insightful and useful information and strategies that can be implemented immediately and creates tangible results. I’ve been a loan officer for a number of years and have done alot of transactions. My shear frustration with being with a bank was not being able to do anything within sub-prime. Always being handed down to another partner interested in promoting more of that since one out of every four borrowers have credit challenges. I ordered this system because I know that reinventing the wheel is not the most efficient use of my time. I was so impressed when the system came because it’s ready to use. Everything is there and easy to understand. Even more importantly than that is having the ability to talk to a live person about how to implement everything. The amount of support that Brian provides is amazing so there is no excuse for someone not to be able to be successful in this market. The market being that refinances are going away and there has to be a new way of getting business. If you’re hesitating there is no reason because this system has everything. “I came to the mortgage business during the refinance boom. I was taught to do a pre-qual, application, close and on to the next one. Brian Sacks personal One on One Mastermind Coaching has set the foundation for the transition to purchases and more importantly how to effectively market. He has established a solid foundation in order to be successful and maintain staying power in the mortgage business. I purchased Brian’s system and have found all of his materials to be exceptionally helpful in growing my mortgage business. I have put all of his plans into place and have more than tripled my business in the last year. I am still in the process of putting more of his plans in place; it just takes time to do all that. So let me encourage you to invest in the system as I did and work with Brian. You don’t get better at anything by associating with people who make less money, or are inferior to you at what you wish to excel in. With Brian’s coaching, I will constantly be sharpening my skills and taking my level of marketing to different levels. As soon as I am done putting my marketing on auto-pilot, there will always be the next step to go to. Brian’s system has given me an outlet for all of my creative energies and talents, and this path has proved invaluable in my business and personal life. I have learned that lifestyle and happiness is the most important element. That your business should work for YOU, not vice-versa. All of these things are immeasurable by calculator or pen and paper, but they have been the most valuable realizations to me.